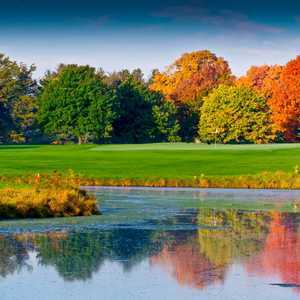 OKEMOS, Mich. - When you first arrive at College Fields Golf Club, your expectations are likely to be as tempered as a high schooler who found out that the prom queen was only joking when she said she'd go out with him. Both the clubhouse and the linked community's sales office are trailers - despite the fact College Fields opened back in 2005. College Fields Golf Club's 13th hole starts with a daunting forced carry and a wood bridge. 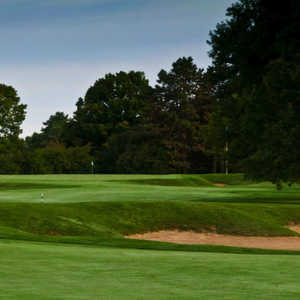 Its greens fees are so comically low - $25 weekdays for a golf course right down the road from Michigan State University - you instantly don't expect much in terms of conditioning. No fancy brochures touting the big name who designed the course, either - because even the most ultra obsessed golf nut has never heard of David Savic, the soul who did. "What is this place?" first-time College Fields player Peter Schlesinger said, looking around the modest arrival area. Then, a funny thing happens. Golfers like Schlesinger get out on the golf course and start smiling. Even in today's time of great overhype, some things still step up and deliver unexpected delights. College Fields isn't a spectacular golf course. But it's a pretty darn good one. From the sprawling view on its first hole to that last daunting forced clear off the tee on 18, it brings plenty of shots to keep you entertained. It does this on a course that's in very good shape. Those low-green-fees-dog-track, trailers-still-being-used-there-three-years-after-opening fears turn out to be completely unfounded. Instead, Course Superintendent Gregory Bishop is College Fields' undisputed MVP. The greens are Bishop's best work. They roll super true - and largely straight. College Fields is the course where you can live out your Tiger Woods' clutch long-putting fantasies. One of the worst putters I know hit two 40-footers from the collar just off the green at College Fields. Getting it to the green at College Fields isn't always so easy, though. There wasn't much dirt moved in the course's construction, but the natural land here was full of thick, gnarly, branchy bushes, and shooting over what quickly feels like fields of this becomes the norm. The fairways look wider than they actually are, too. It's a combination made in lost ball heaven with shots veering into deep brush or just disappearing into the deceivingly thick grass that runs along the edges of the fairways. At least it gives the turkeys something to gobble about - or whatever it is that turkeys actually do. These birds are all over College Fields' back nine - lounging in the wild grass near the 12th hole's white tees, languidly walking down the 16th fairway, letting golfers know that they hold the right of way in this melting pot. You will see a fair number of students, along with older couples and businessmen playing. Walking is encouraged, and several holes are close together, though the walk from the ninth green to the 10th tee is no picnic, nor is the trek from 11 to 12. 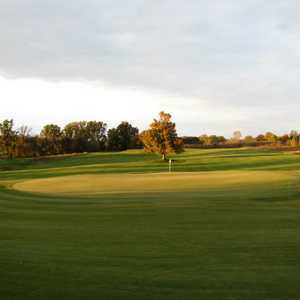 Yes, you might actually burn some calories golfing here. Of course, as cheap as the cart fees are, more than 60 percent of the players on this day rode around anyways. "No wonder our economy's in the toilet," Schlesinger snorted. "America's turned into a bunch of golf cart riding wimps." You can't exactly blame College Fields for this. It's one of those rare things that perform above expectations. Parts of College Fields Golf Club can be a little goofy. Like the mini par-3 15th (120 yards from the back tees) that seems crammed in between 14 and 16 just to make sure there are 18 holes. There are too many similar par 4s, too. In fact, there's a stretch of nine straight par 4s that starts on No. 6 and don't end until the par-3 15th. But when you play 13 - a devious 368-yard par 4 that starts with a long carry over a massive field of deep brush (one that a wood bridge runs over), and then curves up to a green that's tucked back with tall trees blocking it and almost forcing you to take the long way - everything seems all right. Whether you manage par or not, you'll be smitten. Of course, on this day, the 13th hole included a green so covered in fallen leaves that it was almost impossible to hit a good putt on it - the only real disappointment all round in course conditions. Can someone add a leaf blower to the maintenance shed? That's College Fields. It's not making the Dean's List, but it more than passes and pleases. If you want something of an upscale dining feel - with a few cute college-aged waitresses - Gilbert and Blake's just down the street close to the entrance ramps to Interstate 96 isn't a bad pick. The food, while not spectacular, can be good, and it's a place that can impress Michigan business associates. I play every single public course in the area multiple times a season and College Fields in one that I always return to again and again. There are some points in the review that are true and others that simply are not. I have no affiliation with this course except that I am a frequent patron. This is a great course (back nine my favorite) and too much is misleading in the review to point out in this comment. It's well worth checking the course out for yourself. For the price I would put this course up against ANY in the area. If you are more interested in the appearance of the clubhouse than the golf course maybe Walnut Hills would be more to your liking.